“Solo,” the latest installment in the “Star Wars” series, retreads its title character’s legendary shenanigans with occasional bursts of entertainment. Sadly, it’s a pointless motion picture. “Star Wars” has built upon its already massive cultural following since Disney purchased the franchise in October 2012. The newest trilogy of films is set to end next year, with standalone films planned for the foreseeable future. “Solo” is the second of these standalone features, following 2016’s “Rogue One” in their shared mediocrity and fanboy fetishism. Han Solo (Alden Ehrenreich) is a roguish young man living on the streets with his girlfriend Qi’ra (Emilia Clarke), but the two are separated when she is tragically left behind during their attempted escape from their home planet. Enlisting in the Imperial military, Solo meets Tobias Beckett (Woody Harrelson) and his partner Val (Thandie Newton), smugglers who provide him with a means to escape his past and achieve his lifelong dream — to be a pilot. When they attempt to steal a batch of fuel, the mission goes terribly wrong, leaving Beckett and Solo to negotiate with notorious mob boss Dryden Vos (Paul Bettany). Solo reunites with Qi’ra, now Vos’ right-hand woman, and they agree to a new deal: Solo and his friends must steal unrefined fuel, then make it to a refinery in record time to deliver the goods before they explode. 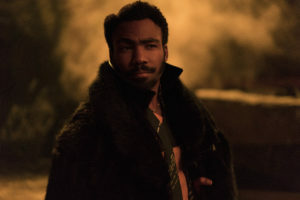 Together with Chewbacca (Joonas Suotamo), Lando Calrissian (Donald Glover) and Lando’s droid L3 (Phoebe Waller-Bridge), Solo’s motley crew embarks on their impossible mission. Flying into release with a curse, “Solo”’s production was troubled from the start when Disney decided to fire original directors Phil Lord and Christopher Miller (“21 Jump Street,” “The LEGO Movie”) for creative differences, then hire Ron Howard as a replacement mid-shoot. It’s a miracle that the film came together in the end, but “Solo” reflects the tumult throughout the final product. As a whole, the film resembles more of an uneven, voiceless corporate product than a standalone film. Flashes of enjoyable genre homages to classical Hollywood run the gamut from westerns to film noir to World War propaganda pictures, but “Solo” never makes up its mind about what tone it wants to take. As a result, the film rarely takes flight. There are moments where it does, especially during the thrilling Kessel Run sequence, but most of the 135-minute runtime is spent trying to reassemble Lord and Miller’s vision into something more palatable, or at least more mainstream. The screenplay, written by Jonathan and Lawrence Kasdan, has an episodic feel, traveling Han’s well-known life story, dusting it with moments of egregious fan service. These never feel organic, and they stick out like sore, fanboyish thumbs among what could have been a solid film of its own merit. It almost feels like a last-ditch attempt to win over the series’ most ardent fans after the backlash against “The Last Jedi,” which was a rare artistic feat among the recent entries. Still, an underlying charm to the film reflects Solo’s character and lends itself to some entertainment value. But, it leaves one wishing to see what could have been another gleefully anarchic vision from Lord and Miller, rather than the serviceable fun released instead. Howard is a strong, experienced filmmaker, and his direction of “Solo” is competent, with easy to follow and well-staged action sequences. However, the formal choices are even more of a mess than the narrative. They never cohere into anything resembling directorial structure, perhaps a consequence of the creative changes that took place, but that is no excuse. The exceptionally talented Bradford Young’s cinematography is as sharp as ever, but it is weighed down by Howard’s direction and a dull, muddy filter that weakens his compositions. Young’s knack for natural light and color shine through in some moments, however, such as the introduction of Lando. Pietro Scalia’s editing is more uneven, though, offering some scenes adequate room to breathe and others chopped up beyond recognition. The score, by John Powell, is the first in the entire “Star Wars” series to be entirely forgettable. The film’s particularly strong element, is, without question, the mostly wonderful cast. Ehrenreich, fresh off his breakout role in the Coen Brothers’ “Hail, Caesar!” demonstrates his leading man chops as Solo. Frankly, he knocks the role out of the park, nailing Harrison Ford’s mannerisms and never descending into affect or impersonation. He plays Solo with a wide-eyed, boyish wonder, one balanced by a naive cockiness that believably evolves into Ford’s cynically smooth operator. The supporting cast is lead by Harrelson, who largely plays a variation of his own persona here, fitting in exactly where Howard needs him. On the other hand, Clarke couldn’t be blander as Qi’ra, forcing her castmates to pick up the slack at almost every turn. Glover excels as Lando, imbuing Billy Dee Williams’ iconic role with a youthful, radiant sensuality. However, Waller-Bridge is the real standout as L3, bringing humor, pathos and revolutionary wit to one of the series’ best droid characters. Memorable cast aside, “Solo” manages to raise questions, but not positive ones. “Why, exactly, was this film made?” is chief among them. Sure, the easy answer may be box office dollars, but that mentality leads to films that lack value and don’t stand the test of time. “Solo,” ultimately, has nothing to say, leaving the viewer with little to think about other than how franchising and fandom have a destructive impact on film culture, discourse and production. For a film with so little style or personality, it’s a fun way to kill two hours, but doesn’t offer much else. It’s safe to say that it’ll leave the memory in much faster than Solo’s record 12 parsecs.